Here's a new one on me, solo project from Jenn Wassner of Baltimore's Wye Oak. Wonderful lilting vocal over a concrete purée (it's all about the babyfood at the moment...) of guitar chords and piano arpeggios. Souper duper. Among the many comments about beards and vocal harmonies, what is sometimes overlooked about Fleet Foxes is their fine grasp of the dynamics of a pop song - when to rise, when to fall, a timely key change to shift the mood, an instrumental flourish to spice an arrangement. The second track to see the light of day from their upcoming second album showcases all these qualities (the trilling flute is my own favourite moment). And it's a tune you'll want to sing along to. Oh yeah, and the vocal harmonies (beards) are irresistible and sound like they've arrived from another time. Beautiful and challenging 7 minute opus from the Japanese composer's new album. 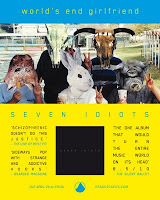 Comparisons to Cornelius are inevitable and WEG does skim across genres like a stone over water (pointedly, another track on the album is titled Teen age Ziggy). Amidst various classical and IDM references though, the overriding impression of this epic instrumental is of the golden ages of pop music, with Bacharach-like string sweeps and 80's power pop, punch-the-air choruses. There are also cameos straight out of the Hard Rock Café. Nothing but glorious and uplifting pop music, all round. *Check out too the great accompanying video, directed by Yohei Saita, featuring a wonderful solo dance interpretation. A genuinely mind-bending and envelope-pushing addition to the canon of surreal New Zealand pop. Atonal piano string arpeggios, followed by the fusion of several high-pitched synth drones, before falling away to be replaced by jam-room bass and drums introducing some lovely woozy guitars. That's just the prelude. At that point the tune kicks in with underwater atmospherics around a chillout drumbeat and high tone bass sound. Plus the vocal has an outer space character as befitting a lyric about inter-species amour. It sounds ridiculous on paper but believe me it's completely convincing in the flesh. It's intriguing, slightly haunting and makes you want to press play again and again. The interview (phone) with Blake Madden from Seattle band Hotels is available to download now in full (23m45s, 70MB approx) - we had played a short extract on this week's show. 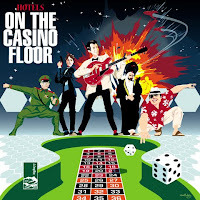 The conversation ranged over film music, casinos, manipulating mood in pop music, John Barry, being based in Seattle, playing bass while singing, surf guitar, and of course the excellent new Hotels album On the casino floor. These were my thoughts on that album, from a few weeks ago. Cass/Flick Records. The first half has unearthly, megaphone vocals, sparse drum machines and at least one piece of movie dialogue. The second half swings between dancing tunes, with very pleasing, building synth arrangements, and ambient drones (including seagulls). Overall, you could say goth-electro - as a description, it's grossly inadequate but I'm a sucker for labels. Have a listen to one of the Patrick Kelleher tracks here. And the entire School Tour side is for listening here. 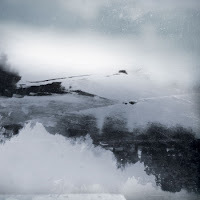 Erased Tapes is a label I'm very fond of and well worth keeping an eye on. This was a release of theirs from last month. 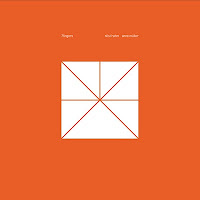 A triumphant collaboration between the pianist/composer and his fellow-German cellist. These are luminous soundscapes ranging from post-classical pieces with an ambient undertow (Teeth), to full-on electronic workouts with glitches and squiggles (7 fingers, sounding quite like something Radiohead might have had a hand in). Check also the emotional tug in the busy, Nymanesque strings of Let my key be C; the minimalist, and very German, electronica of Show your teeth, with violins adding synthesised swells; the cinematic chamber piece Because this must be/Augmentation (which includes Italian movie dialogue for good measure); and the haunting musique concrete of Journey for a traveller. Frahm's production is sublime the whole way through. Another gem on the Erased Tapes label. Another beauty from last month's list. Another one of March's favourites in the UOH cabin. Thoroughly outstanding centrepiece from the Texan's, ex-Lift to Experience frontman's, new album. From the gripping opening line, "Woman, when I've raised hell, you're gonna know it", you will be captivated by the wonderfully slurred delivery for the full 7 minutes. That's without mentioning the heartrending violin backing of Warren Ellis (and others) and the completely convincing dirty realist imagery - "Don't make me rule this home with the back of my hand", "Let me quietly drink myself to sleep". In a way, it's amazing how much drama can be wrought out of a sparse acoustic guitar, a vocal and some strings. I've listened to it about 20 times and it still sounds new every time. However you cut it, it's a compelling masterpiece. An album that's been consuming my brain over the last few days is the new Doomed Bird of Providence, Will ever pray, on the Front & Follow label. It's a set of songs drawing on historical accounts of the early days of colonial Australia. Think dirges, dark waltzes, folk music with a tragic underbelly, and a deep foundation of accordion and droning strings holding it up. I'll have more to say on the album at the end of the month once I've digested it all (it's fairly dense, on first listen). If you've been into anything Black Heart Procession or The Dirty Three have done, you'll love it I'd say. Here's a sample. Just to double up a little bit, I'm posting a few of the March monthly picks in their own right. This is one record (CD in fact) on heavy rotation around at UOH HQ lately. Check it out. Meet Claire Boucher from Montreal, who has produced a fascinating, impossible-to-pigeonhole album. The constant features are haunting vocals - layered, filtered, and antique sounding, calling to mind Liz Frasier or Kate Bush in places - and sparse drum machine+synth backing. The overall effect is of a wide-ranging and completely "other" soundworld. From the de-constructed R 'n B ballad Heartbeats, to the ghostly-lament-masquerading-as-dance-pop of sagrad, the deliriously shoegazey Devon, and the ukulele stomp of Favriel. Be prepared for a trip. An album to treasure. Just came across this on Pascals Country Sounds. Worth sharing I thought. Class band. Future Islands - Untitled new song from Lloyd Hammarlund on Vimeo. All albums, unless otherwise noted.